Today I bring you something a little less scary. I think Halloween and Vintage go hand in hand to perfection, so I made you two freebies in the name of Vintage Halloween - both CU. My first freebie today is made entirely from NeareStore products. 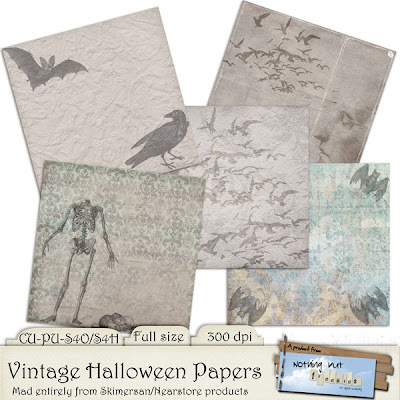 5 vintage papers (almost) without colours but with Halloween stamps. Click image for direct download (4shared) or use alternative links below image. Next up is a pack of tags. 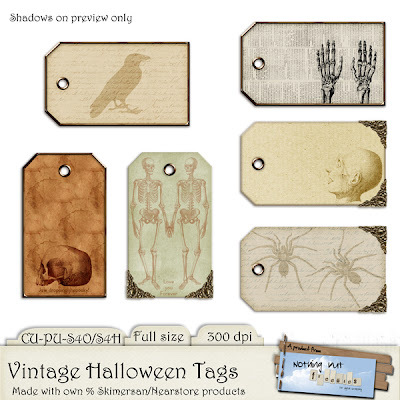 You might recognise the tags - they are 6 of the vintage tags I posted in June, but now with Halloween stamps - again from NearStore. Have fun and come back soon. Thank you so much for this post. I want to let you know that I posted a link to your blog in CBB Digital Scrapbooking Freebies, under the Page 12 post on Oct. 02, 2012. Thanks again. these are gorgeous! thank you so much! I visit farfarhill daily - she's always so generous! I do love your work! Thank you. thank you so much for all your beautifull freebies! hope you'll find some surprise too!